This article is about the motion picture. For the album by Mike Patton, see Mondo Cane (album). For the album by Kai Winding, see Mondo Cane No. 2. 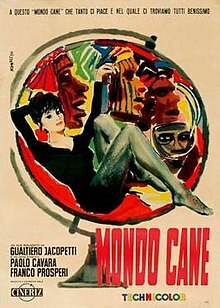 Mondo Cane (meaning A Dog’s World, which is a mild Italian profanity; also known in the United States as Tales of the Bizarre: Rites, Rituals and Superstitions) is a 1962 Italian documentary film written and directed by Paolo Cavara, Franco Prosperi and Gualtiero Jacopetti. The film consists of a series of travelogue scenes that provide glimpses into cultural practices around the world with the intention to shock or surprise Western film audiences. These scenes are presented with little continuity, as they are intended as a kaleidoscopic display of shocking content rather than presenting a structured argument. Despite its claims of genuine documentation, certain scenes are either staged or creatively manipulated to enhance this effect. The film was an international box-office success and inspired an entire genre of mondo films in the form of exploitation documentaries, many of which also include the word "Mondo" (meaning “World”) in their title. During the opening credits, a dog is being dragged and kicked into a dog pound filled with barking dogs. A statue is dedicated to Rudolph Valentino at Castellaneta, Italy, his hometown, in a nightly procession; the narrator points out the similarities of the local men's faces with Valentino's. In the United States, Rossano Brazzi has his shirt torn off by a crowd of female fans hunting for his autograph. At the beach in polyandrous Kiriwina, one of the Trobriand Islands in New Guinea, a large crowd of naked native women run after a handful of men, trying to capture them "not only for autographs". At the French Riviera, a small group of blonde bikini-clad young women on a boat drive by a ship with US sailors, "wooing" them teasingly from the distance by sending them kisses, showing their tongues and flaunting their breasts. In a New Guinean Chimbu community, a woman whose child was killed breastfeeds a piglet whose mother died. At a celebration that recurs every five years, in a matter of hours, dozens of pigs are slaughtered by beating on their heads with wooden poles and eaten, after which the partly cannibalistic community returns to its perpetual state of hunger. Dogs, however, are fed and treated with affection and respect. At the Pet Haven Cemetery in Pasadena, California, dog owners mourn their beloved. In Taipei, Taiwan, dogs are grown, butchered and skinned alive for local dog meat gourmets. In Rome, hundreds of chicks are tinged in many colors and then dried at 50 degrees Celsius to be included in Easter Eggs; according to the narrator, of the 600 that undergo it, approximately 70 do not survive the procedure. For foie gras, geese in Strasbourg are force-fed using funnels. In a farm 200 miles from Tokyo, Wagyu cattle are massaged and fed beer for three or four specialised restaurants in Tokyo and New York. On New Guinean Tabar, the most beautiful women are locked up in small wooden cages and fed Tapioca until they reach 120 kilos to be offered as wives to the village dictator. In a Vic Tanny health club in Los Angeles, overweight women work on losing weight to recover from their previous marriage. At a Hong Kong market, exotic animals are sold for food. At the New York restaurant The Colony, canned exotic animals are served for rich Americans. At a Singapore snake store, a snake is chosen and skinned alive for consumption. At a village in the Cucullo, on Saint Dominic's day, the statue and its followers in the procession carry live snakes. In Nocera Terinese, on Good Friday, the "battenti" beat their legs with glass shards and spill their blood on the streets where the procession will take place. A parade of "Life Savers Girls Association", all from 16 to 20 year old, march towards the Sydney beach where they put on a lifesaving show, including CPR on young men. Due to the nuclear contamination on Bikini Atoll swarms of dead butterflies drift at sea, birds hide in holes in the ground, a species of periophthalmus fish migrated to the trees, sea gulls breed on sterile eggs, and disoriented turtles move inland and die in the desert. Birds nest in their skeletons. In Malaysian underwater cemeteries, Sharks get accustomed to human flesh. Their fins are dried on the beach and collected by disabled fishermen, who sell them to the Chinese as aphrodisiacs. A 12 year old boy has been killed by sharks, and the fisherman exact revenge by shoving toxic sea urchins into the mouths of sharks, releasing them again to slowly die. Rome: In the Capuchin Crypt, bones were arranged as ornaments, and on Tiber Island, the it:Sacconi Rossi ("Red Sacks") guard the bones of nameless victims of the pest since around 1600, which on Fridays are cleaned by local families including children. On the Reeperbahn in Hamburg, people indulge not death but life by drinking beer and suffer from the symptoms of hangover in the morning. They dance, brawl, and fool around. Tokyo has a massage parlor for men who are drunk. In Macao, the dead are covered in make-up for the funeral. In Singapore, there is a hotel for the dying. Cars are smashed at a junkyard of Los Angeles and reduced to cubes. In Czechoslovakia, Yves Klein makes his paintings with the help of some female models and some musicians to express his favorite color, blue. In Honolulu, tourists are showered with leis and witness the Hula Dance. In Nepal, Gurkha soldiers perform a rite of passage by dressing up in women's clothing and bulls are beheaded for ritualistic purposes. In Portugal, there is the running of the bulls and bullfights where matadors challenge the bulls. At Goroka, Papua New Guinea, there are indigenous tribes who go to church. The film concludes with a cargo cult at Port Moresby, New Guinea. In the beginning, as Cavara (who took the helm for European and Euro-Asiatic zone) and his supervisor Stanis Nievo' interviews revealed, Mondo Cane was a unique project conceived with La donna nel Mondo, and worked at the same time (1960–62). Mondo Cane was an international box-office success and inspired the production of numerous, similar exploitation documentaries, many of which also include the word "Mondo" in their title. These films collectively came to be recognized as a distinct genre known as mondo films. In addition, the film's success led Jacopetti and Prosperi to produce several additional documentaries, including Mondo Cane 2, Africa addio and Addio zio Tom, while Cavara directed La donna nel mondo, Malamondo, as well as the anti-Mondo drama Wild Eye (Occhio selvaggio). The film was nominated for two awards for the 1962 film season. It won the David di Donatello for Best Production (Migliore Produzione) by the Accademia del Cinema Italiano, which it shared with Una vita difficile. It was also nominated for the Palme d'Or at the 15th Cannes Film Festival, which it lost to O Pagador de Promessas. The theme song, "More", was written by Riz Ortolani and Nino Oliviero, and was given new lyrics in English by Norman Newell. In 1963, the song was nominated for the Academy Award for Best Original Song, where it lost to "Call Me Irresponsible" from the film Papa's Delicate Condition. The film spawned several direct sequels, starting with Jacopetti and Prosperi's own Mondo Cane 2 (also known as Mondo Pazzo), released the following year. Much later, in the 1980s, two more emerged: Mondo Cane Oggi: L'Orrore Continua and Mondo Cane 2000: L'Incredible. The films continued into the nineties with two follow-ups from German filmmaker Uwe Schier; despite the fact that they were the fifth and sixth installments, they were titled Mondo Cane IV and Mondo Cane V.
As well as encouraging sequels, Mondo Cane's shock-exploitation-documentary-exquisite corpse style is credited with starting a whole genre: the mondo film. Examples include Mondo Bizarro, Mondo Daytona, Mondo Freudo (1966), Mondo Mod, Mondo Infame and Mondo Hollywood; later examples include the Faces of Death series. The film also inspired lampooning, including Mr. Mike's Mondo Video, written by Saturday Night Live's Michael O'Donoghue and starring members of the contemporary cast of said program. In 2010, Mike Patton released a musical album in tribute to the film, also called Mondo Cane. ^ Goodall, Sweet & Savage, 22. ^ Kerekes and Slater, Killing for Culture, 113–114. ^ See: La donna nel mondo. ^ "Accademia del Cinema Italiano - Premi David di Donatello". Accademia del Cinema Italiano. Retrieved 26 April 2010. ^ "Festival de Cannes". Festival de Cannes. Retrieved 26 April 2010. ^ Kerekes and Slater, Killing for Culture, 152–153. ^ Kerekes and Slater, Killing for Culture, 157–158. ^ Kerekes and Slater, Killing for Culture, 107. Goodall, Mark. Sweet & Savage: The World Through the Shockumentary Film Lens. London: Headpress, 2006.